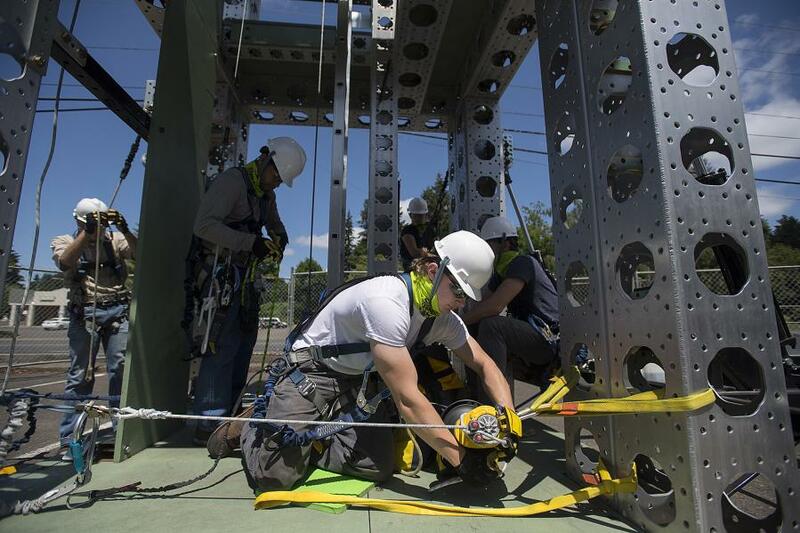 Sun., June 24, 2018, 9:20 a.m.
It’s not out of the ordinary for drivers near East Mill Plain Boulevard and Grand Boulevard to see people wearing hard hats and climbing gear gathered around a steel tower next to the road. These are students, and their training is actually becoming more common. More students than ever are enrolling at the Northwest Renewable Energy Institute, a program offered by the International Air and Hospitality Academy. A career as a wind turbine technician, with strong starting wages and potential to travel but requiring little education, has made the program grow faster than its culinary, air steward or railroad conducting programs. Clark County may not have any wind farms nor any large-scale solar projects, but demand is growing for workers in renewable energy. Solar panel installers and wind turbine technicians are the two fastest growing jobs in the United States, according to the Bureau of Labor Statistics. Local economic development officials have targeted renewable as an industry of the region’s future. Firms that install solar panels to homes and businesses have seen their workforce and revenues grow, just like enrollment at the International Air and Hospitality Academy’s wind turbine program has climbed. Students are flocking to the school from around the country, said instructor Tom Baurus, and most graduate with jobs lined up, either stationed at a wind farm or traveling from job-to-job, country-to-country. But he said the biggest driver he sees in the worker s is a belief that they are getting in early on a growing movement. Over the six-month program, students are taught to diagnose and repair common problems with the turbines. Much of the training centers around rescue operations and safety, given the work requires more grip strength than most jobs and the work site is hundreds of feet in the air. Students practice on a 35-foot scaffold in the school’s parking lot. But these aren’t the only jobs on the rise. While Asia dominates much of the manufacturing of wind turbines and solar panels, companies that install, assist and maintain these technologies are poised to grow. One example is SunModo, a maker of equipment that speeds up the solar panel installation process. The 10-year-old firm, headquartered in east Vancouver, has grown to 50 employees and has seen revenues rise significantly. They declined to reveal those figures publicly. “It’s great timing to be in this industry,” said Stella Sun, marketing director. Part of that timing revolves around advances in energy technology. The International Renewable Energy Agency predicts wind and solar will be cheaper than fossil fuels by 2020. Even as subsidies are set to decline, firms say the industries have grown enough that they can stand on their own. Elemental Energy employs more than 50 people and has seen double-digit growth every year since Grieser founded the company right out of college a decade ago. He said the company is now just trying to figure out its niche within the burgeoning industry. That kind of flexibility is why local economic development officials covet the industry. The Columbia River Economic Development Council, which leads efforts to nab and grow businesses, said in its latest strategic plan that the region’s skilled workforce and tech legacy could land more “clean tech” companies. “Clark County has a competitive foundation for supporting growth in clean technology with a specific focus on the technologies associated with solar energy and battery production,” the organization said. However, they won’t be the only organization with that idea. As far as wind and solar go, there has not been much hiring in Southwest Washington, according to the state Employment Security Department. The latest data shows the number of wind technicians has mostly stagnated after early wind projects in the Columbia River Gorge. Meanwhile, the number of solar panel installers is difficult to break out because they are lumped in tightly with construction, said regional economist Scott Bailey. Renewable energy advocates, however, say much of the growth is happening in plain sight. Demand is rising for greener construction, said the Seattle-based Northwest Energy Coalition. The organization points to a 2018 U.S. Department of Energy report that finds there are 83,000 jobs in Washington in high-efficiency lighting, appliance manufacturing and heating and air conditioning. “For the most part, energy efficiency is invisible. But it’s made a huge difference both economically, in jobs, and for the energy sector as a whole,” said Sean O’Leary, a spokesman for the industry. O’Leary said those systems will put a greater demand on renewable energy to power them, and thus fuel demand for more solar panel installers, wind turbine technicians and the like. Likewise, demand will rise for tradespeople who know how to handle new technologies, said Megan Owen, market strategist for the construction firm McKinstry, with offices all over the West, including Spokane, Portland and Seattle. For Baurus, the wind turbine tech instructor, he said that is good news for his students now and in the future. Not only is enrollment rising, he said, but so are the numbers of companies hiring them. “The list is just growing,” he said. Published: June 24, 2018, 9:20 a.m.